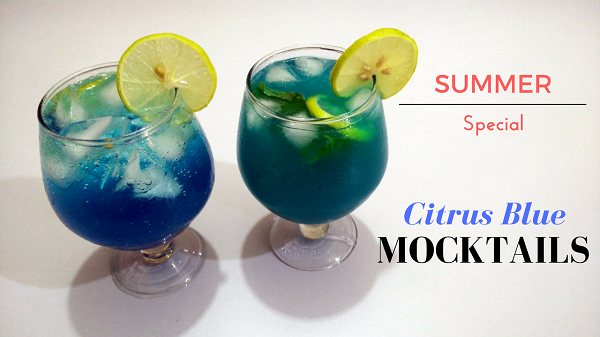 Today I am sharing 2 of the most delicious and hydrating non-alcoholic drink Recipes – Citrus Blue Mocktails – made from Citrus Blue Syrup / Blue Curacao Syrup. Citrus Blue has a tangy, sweet-bitter flavor of oranges and sweet lime. There are many variations; I have made these Mocktails by adding Pineapple Juice and Club Soda. Try these refreshing summer drinks at home and serve at your next house party / get together. Take a serving glass, fill it 3/4th with Ice cubes. Now add Citrus Blue syrup, Lemon Juice, Lemon wedges, Fresh mint leaves and stir. Add Pineapple Juice and fill the glass with Limca (Lime flavored Soft Drink). Take a serving glass and add Citrus Blue syrup. Add Lemon Juice, Lemon wedges, and stir.